Don’t see the General Settings tab? It’s new to Page Generator Pro 2.0.4 and higher. Ensure that your license is valid, not expired and that you’ve updated to the latest version of the Plugin. 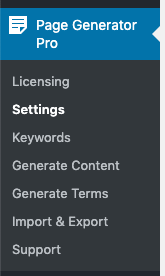 The General Settings provides options for defining site wide settings in various areas. Whilst there is no evidence that search engines penalize sites that use a particular Plugin, mass page generator etc, some users prefer to hide that they are using Page Generator Pro. The CSS Prefix option allows users to optionally define a unique string prefix to use for shortcode HTML and CSS output, instead of the default page-generator-pro prefix. Defining your own prefix, such as your site name, will replace the default page-generator-pro prefix on frontend shortcode HTML and CSS output. It does not change the plugin name. The prefix supports letters and dashes only. Any other characters entered will be removed.